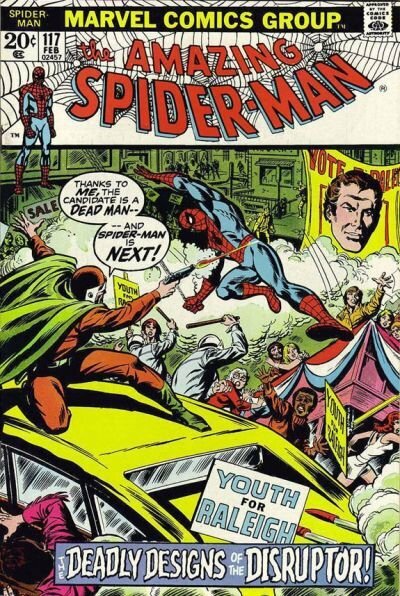 Click Here To See Amazing Spider-Man #117 Comic Book! Check out this superbly detailed 1972 Amazing Spider-Man SPLASH page, which was penciled and inked by the great John Romita, from the classic story titled: "The Deadly Designs of the Disrupter!" This nice SPLASH features Peter Parker using all of his Spider strength in the dark, as he uses his webbing to save the ceiling from collapsing on Gwen, MJ, and Harry Osborn at a political fund raising event! This splash was one of the FEW pages from this story that was actually penciled AND INKED by the great John Romita, as most pages form this story were redrawn panels from the 1968 SPECTACULAR SPIDER-MAN #1 magazine....But this SPLASH right here was a fully drawn by Romita in 1972 for this issue! Don't miss out on a chance to own a John Romita penciled AND INKED "AMAZING SPIDER-MAN" SPLASH PAGE. ALL HIGH end pieces of art, including this one, are able to be purchased with VERY fair time payment plan options, and trades are always considered towards this and "ANY" art on our website! Just send us an email to mikeburkey@aol.com and we can try to work something out.